was cleaning out some old files and found a spreadsheet from this time last year. On said spreadsheet I had recorded the prices of some random purchases at Walmart (what, you don’t do that?). Rather than dragging the file over into the ol’ recycle bin, I decided to use my numbers to take a quick look at my personal level of inflation for the past year. Off to Walmart I went. 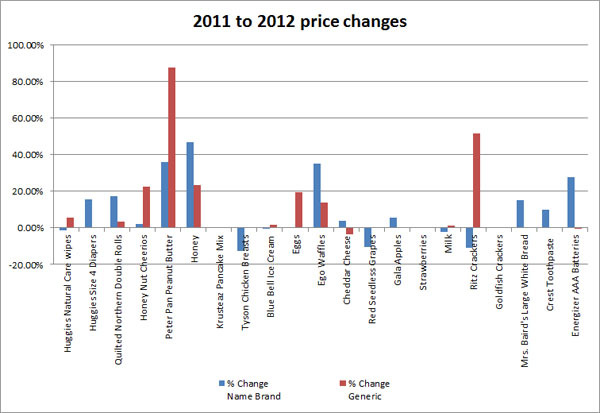 Here’s a look at my costs from 12 months ago vs. my cost today for various goods. Yikes. Apparently there was some sort of peanut crisis that I was unaware of. Bad news, fellow PB & honey sandwich lovers, apparently the man is not a fan of the PB &H…or generic crackers. As always, happy inflated shopping everyone.